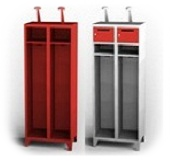 The lockers for cloakrooms are characterized by massive welded construction, modern design and careful processing. 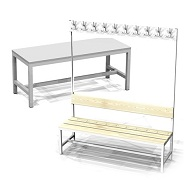 In our assortment you can find more than 100 types of cloakroom lockers and many versions of metal benches. Our products are suitable for cloakrooms in industry and food plants, at schools, for changing-rooms and cloakrooms in surgeries, hospitals, agencies and security services. 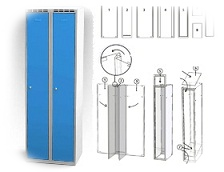 The lockers with HPL doors are highly demanded for cloakrooms in swimming pools and fitness centers. The lockers with doors of laminate chipboard are very suitable for offices and institutions. The body of locker is basically in grey color RAL7035, the doors are available in 6 colors (grey RAL7035, light blue RAL5012, dark blue RAL5010, red RAL3000, yellow RAL1023, green RAL6024) without any surcharge. The basic color of the locker body is grey RAL7035, the doors are available in 6 colors without any surcharge: grey RAL7035, light blue RAL5012, dark blue RAL5010, red RAL3000, yellow RAL1023, green RAL6024. 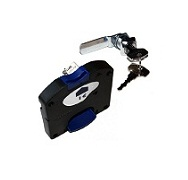 Check out the detailed advantages of our lockers here.